It is totally cranberry season!!! 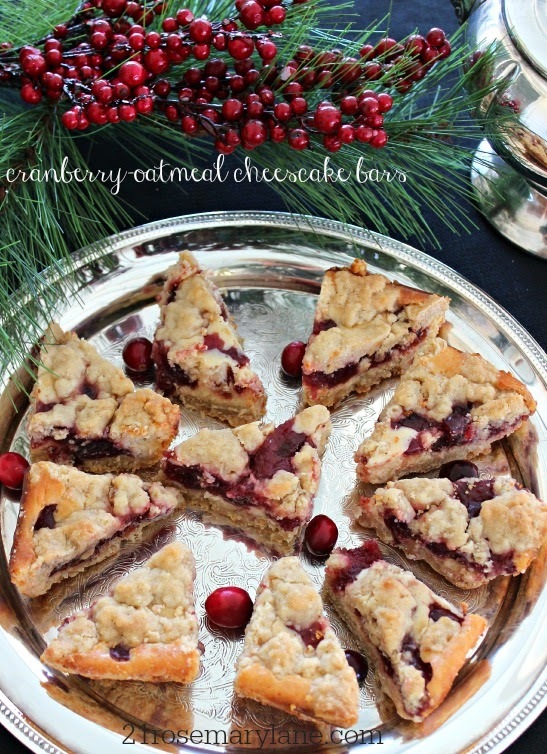 I love cranberries, whether it is cranberry sauce, cranberry stuffing or cranberries paired with oatmeal and cream cheese in these little buttery bites...I love cranberries! Making only a few changes, I decided to give this dessert recipe from Borden a whirl. Heat oven to 350 degrees and spray a 13X9 inch baking pan with cooking spray, Next combine the flour, oats, brown sugar and butter until it forms coarse crumbs. Reserve 1 1/2 cups of the mixture and press the rest into the bottom of your baking pan. Bake in oven for 15 minutes. Next beat the cream cheese until fluffy and then add the sweetened condensed milk and beat until smooth, then mix in the orange juice. Spread the mixture over the partially baked crust. In a small bowl blend together the cranberry sauce, the 1 T of brown sugar, the cornstarch. 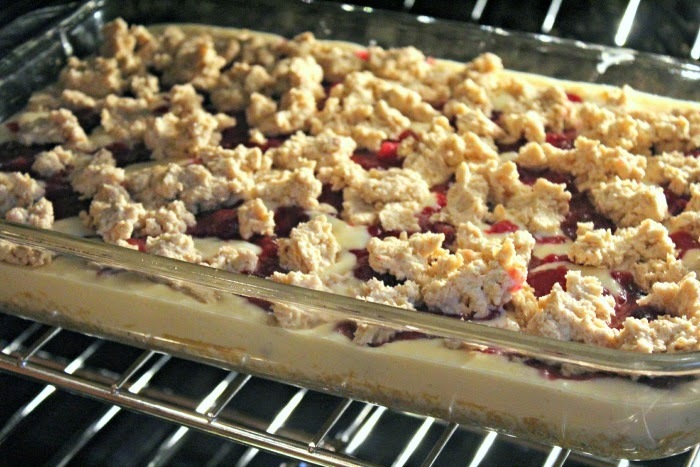 Then spread the cranberry mixture evenly on top of the cream cheese mixture and top with the remaining crumb mixture. Bake for 40 - 45 minutes depending on your oven, until golden brown. Remove from oven and let cool complete. Chill and then cut into bars. Look and sounds so good...cranberries are the best! Have a great day! Hi Barbara! These look SO good...thanks for sharing your recipe with us. I also enjoyed reading your Thanksgiving post about how your family celebrates...it gives me ideas to use when my family comes to my house this year. Your table setting is just beautiful! This is definitely cranberry season! Those bars look yummy and pretty. Thanks for sharing the recipe. I may give them a try. Yummy goodies - when does the lemon/orange juice get added in the recipe?? Hey pretty lady...you have me drooling right now! 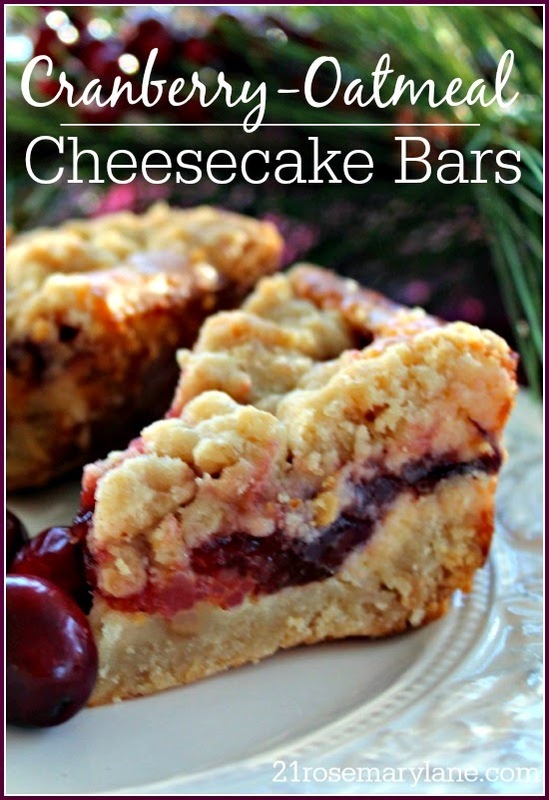 I'm pinning this great recipe to make ASAP! I love how you celebrate Tksgiving with your family and you are a blessed girl. I love everything here and I wish you and yours a blessed Thanksgiving.